O wondrous Saint Thérèsa of the Child Jesus, who, in thy brief earthly life, didst become a mirror of angelic purity, of courageous love and of whole-hearted surrender to Almighty God, now that thou art enjoying the reward of thy virtues, turn thine eyes of mercy upon us who trust in thee. Obtain for us the grace to keep our hearts and minds pure and clean like unto thine, and to detest in all sincerity whatever might tarnish ever so slightly the luster of a virtue so sublime, a virtue that endears us to they heavenly Bridegroom. Ah, dear Saint, grant us to feel in every need the power of thy intercession; give us comfort in all the bitterness of this life and especially at its latter end, that we may be worthy to share eternal happiness with thee in paradise. Amen. O Lord, who has said: "Unless you become as little children, you shall not enter into the kingdom of heaven"; grant us, we beseech Thee, so to walk in the footsteps of thy blessed Virgin Thérèse with a humble and single heart, that we may attain to everlasting rewards: Who livest and reignest, world without end. Amen. make you much loved. Amen. and favors we ask through your intercession. Amen. favors we ask through your intercession. Amen. that it "may ever be perfectly fulfilled in me." learn to know myself better and to love God more. longer fear death, for it will unite us to Him forever. He may be pleased with us as He was with you. words on earth be "My God, I love You." of by your divine spouse to work countless miracles. 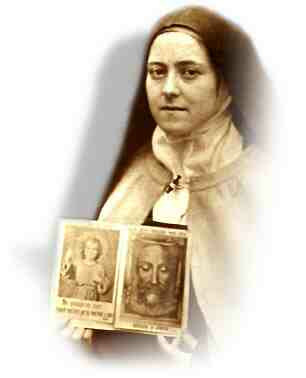 St. Thérèse of the Holy Face, Pray for us. St. Thérèse, child of Mary, Pray for us. St. Thérèse, devoted to Joseph, Pray for us. 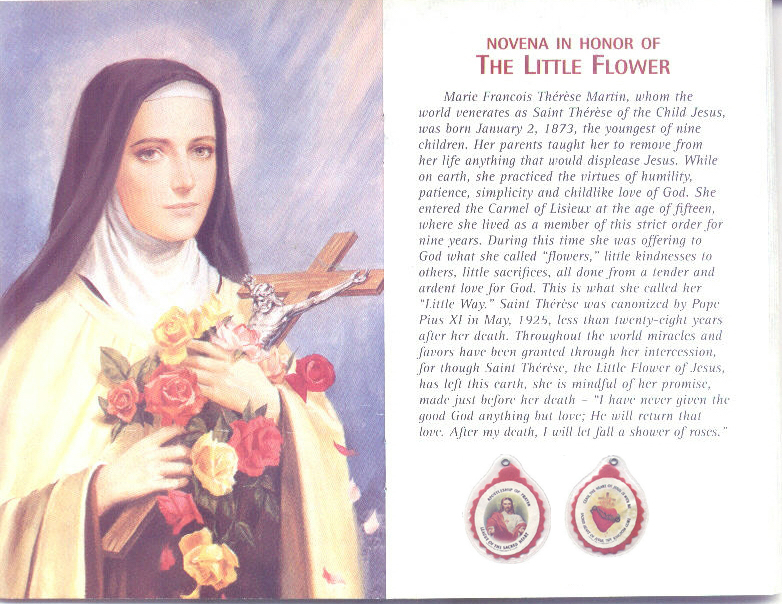 St. Thérèse, angel of innocence, Pray for us. St. Thérè,model child, Pray for us. St. Thérèse, pattern of religious, Pray for us. 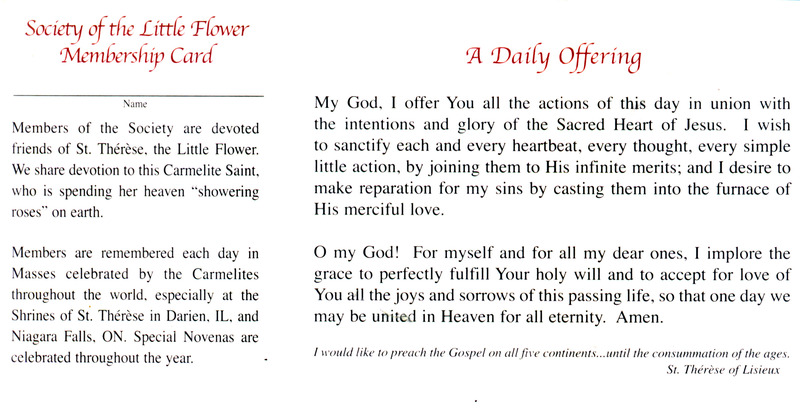 St. Thérèse, flower of Carmel, Pray for us. hardened hearts, Pray for us. St. Thérèse, healer of the diseased, Pray for us. For the Blessed Sacrament, Pray for us. 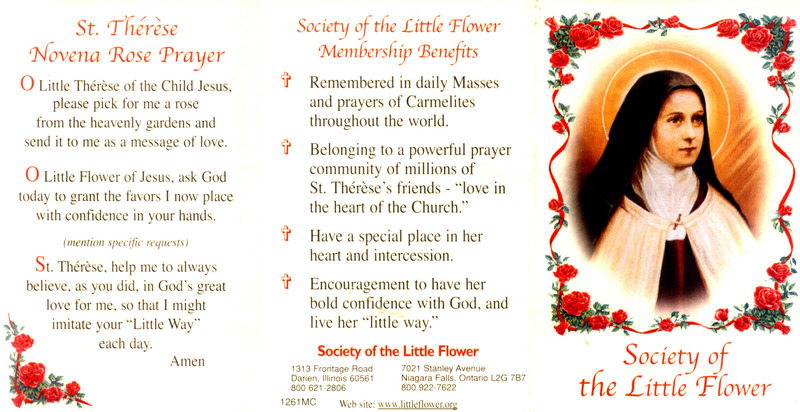 St. Thérèse, filled with angelic fervor, Pray for us. apostle's zeal, Pray for us. to the Holy Father, Pray for us. love for the Church, Pray for us. love for God and neighbor, Pray for us. a heavenly flame, Pray for us. St. Thérèse, victim of divine love, Pray for us. St. Thérèse, patient in sufferings, Pray for us. St. Thérèse, eager for humiliations, Pray for us. St. Thérèse, consumed with love, Pray for us. St. Thérèse, rapt in ecstasy, Pray for us. as a little child, Pray for us. spiritual childhood, Pray for us. trust in God, Pray for us. for suffering, Pray for us. little things, Pray for us. Who refused God nothing, Pray for us. Who sought bitterness in this life, Pray for us. Who told us to call you little Thérèse, Pray for us. priests and missionaries, Pray for us. Who gained countless souls for Christ, Pray for us. a shower of roses, Pray for us. doing good upon earth," Pray for us. the sins of the world, Spare us, O Lord. the sins of the world, Graciously hear us, O Lord. V. Pray for us, St. Thérèse. virgin, that we may obtain everlasting rewards. Who lives and reigns forever. Amen.